We have kind of been on a rice kick lately. Whenever I come up with a main dish and I ask what sounds good for a side everyone says “rice please”. Well I love rice as much as the next person, but just plain old rice? Umm no. I mean I have been known to put a little butter on rice with soy sauce and Sriracha and just about make a meal out of that, but that is not very often. So of course when rice is requested I have to come up with a new and different way to flavor it up. I always cook my rice in chicken stock, but you need more than a little clucker juice to make it interesting right? Just like my Lemon Pepper Rice, I want to compliment what we are eating so I loved the sound of a recipe I found on Creative Culinary. I loved the ingredients and I loved that it could be warm or cool so no juggling getting everything done at once. I of course tinkered with it a bit but I can tell you that everyone that ate loved it too! I think the dressing on it’s own would be fabulous on a salad! We had this with a Mexican style chicken and it was perfect. I love the combo of Serrano/lime/cilantro. Cilantro is one of my all time favorite herbs to use. The lime just gives it that nice fresh “pop” and again you can remove the ribs and seed from the peppers and adjust the amount of peppers you use to suit your taste. Place 1 1/4 cups of the cilantro, 1/3 of the Serrano, 2 cloves garlic, white wine vinegar, zest of 1 lime, and cumin in a food processor and blend well, adding the olive oil as it mixes. Set aside. Heat 1 tablespoon olive oil in a medium skillet over medium heat. Add the remaining Serrano pepper and onion to the pan. Saute until the onion is translucent, about 7 minutes. Add the garlic and cook for an additional 2 minutes. Remove from heat. 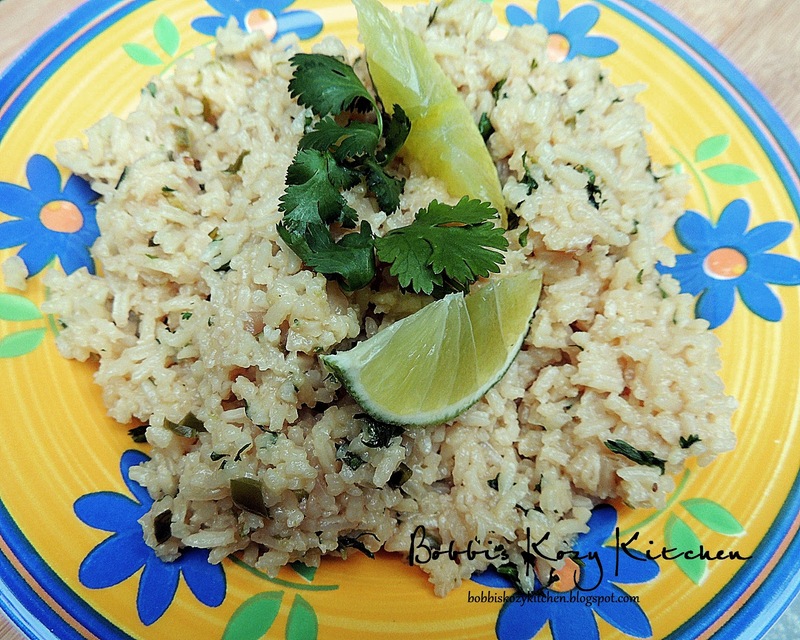 In a medium sauce pan, place rice, cooked pepper mix, lime juice, remaining lime zest, and chicken stock. Cover and heat to a boil, reduce heat to low and cook for 20 minutes. Place cooked rice in a large bowl, fluffing with a fork. 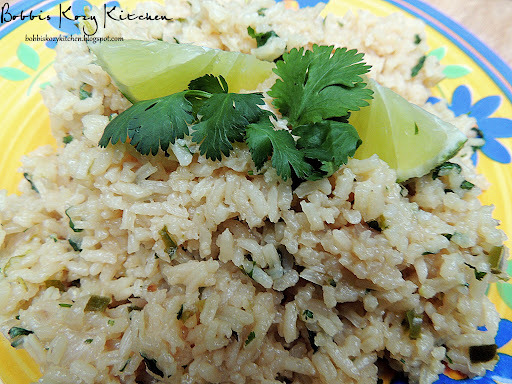 If serving room temperature, allow the rice to cool for 1 to 1/2 hours, fluffing occasionally before adding the dressing. If serving warm fold in the dressing. Garnish with the remaining 1/4 cup chopped cilantro.